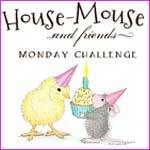 Welcome to a brand new challenge at House Mouse & Friends. Easy peasy, or what do you think? as you can see, she's turning four during the summer! when I saw it for the first time, I knew it was a 'have to have' image. I love the colours,and think they are suitable for a Birthday card as well. and the banner is made with a Magnolia die. the 'Dragonfly'alphabet Set from Quic Kutz. Voilà; Dies and Punch, challenge completed! masked together with a happy looking mousy friend. For this challenge we have a wonderful sponsor, QKR Stamped. 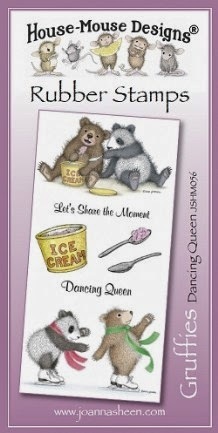 Offered by our lovely Teamie and Challenge Hostess, Sue K and it is a fabulous Stampendous!, House-Mouse Designs®, Cling Rubber Stamp! and join in with the Die Cuts and/or Punch challenge. Gorgeous card with pretty papers and great coloring, Dorte...love your personalised stamp is so lovely! Nåh...hvor er det sødt. Du er altså en ørn til farver, stempler og maleteknik. SÅ flot og gennemført - hver gang. sweet and a very beautiful card Dorte. Lovely card. Funny mousses. Magnificent soap bubbles. Bravo ! Thanks for joining us at Charisma Cardz Today ! 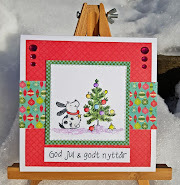 A gorgeous card Dorte, a fabulous design and I love the adorable image and great details!! Hi Dot, this is now my favorite stamp! Love the background paper with the colors you chose to use. Bubbles look so real, such a fun card. stunning card, I love the bubbles! thank you for joining us at creative inspirations this week. This is a super, sweet birthday card! Perfect for a summertime birthday. Thanks so much for joining us at Seize the Birthday! This image is adorable and you have featured it so well!! Your card is adorable Dot, cute image and such bright and happy colours. Disse musene er jo bare helt fantastiske :-) Og punchen du har brukt på siden der, var superflott. aww, cute! such a fun happy birthday card in very pretty colours, beautifully coloured. thank you so much for playing along with us this month at penny black and more. Hi Dot awww love this stamp, love the soft colouring, am sure it will be well received as a B/day card.